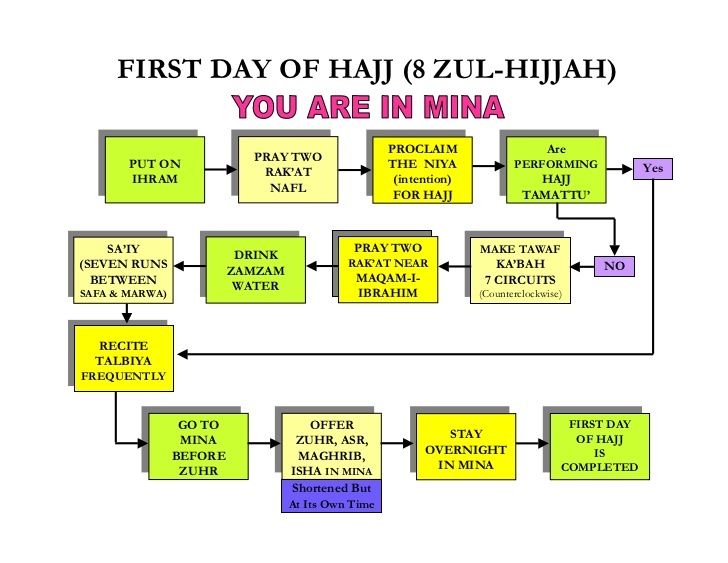 Are you looking for the Method of Performing Hajj? Here you will find a perfect guide about the topic. The literal meaning of the term Hajj is the will and desire to visit, but in the terminology of the Shariah, it means the will to visit the Holy Kaaba. There is Surah in Quran with the name Surah Al-Hajj. From the above supplication the purpose of the construction of Kaaba becomes clear. Pilgrimage to the House of Allah (Kaaba) is not an obligatory act. It is compulsory upon those who are sound of mind, adults and have provisions of travel. If a person cannot afford the journey, then he/she will be forgiven. The pilgrims put on Ihram on the morning of 8th Zil Hajj, and go to Mina where they spend the night in prayers. The Dhuhr, Asr, Mughrib and Isha prayers of 8th Zil Hajj and Fajr prayer of 9th Zil Hajj are to be performed in Mina. 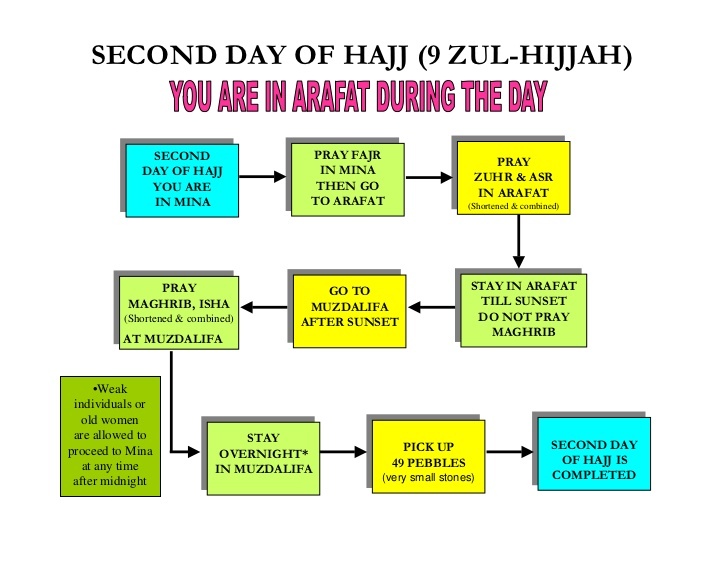 On the 9th of Zil Hajj, after Fajr prayer, the pilgrims move on to the plain of Arafat. The stay in this plain is called Wuquf-e-Arafat. The assembly at Arafat is the most important part of Hajj without which Hajj would be incomplete. At Arafat, pilgrims pray and ask Allah for forgiveness. The Dhuhr and Asr prayers on the 9th of Zil Hajj are to be offered together in this plain. Before sunset, the pilgrims leave for the plain of Muzdalifah, where they spend the night in prayers. The Mughrib and Isha prayers are performed together in the plain of Muzdalifah. Forty-nine pebbles are to be thrown at three stone pillars collected from here. In the morning, on the 10th of Zil Hajj, the pilgrims leave for Mina, to throw seven pebbles at the largest stone pillar, Jamarat-al-Uqba, after which a sacrifice is offered. The male pilgrims may now shave their head or cut their hair short. Female pilgrims may cut a lock of hair only. The pilgrims can take off the Ihram and wear ordinary clothes. The pilgrims then perform Tawaf-e-Ziyarat, which is the second most important aspect of Hajj. After Tawaf, the pilgrims offer two rakaats of prayer at the station of Ibrahim and perform “Saee”. 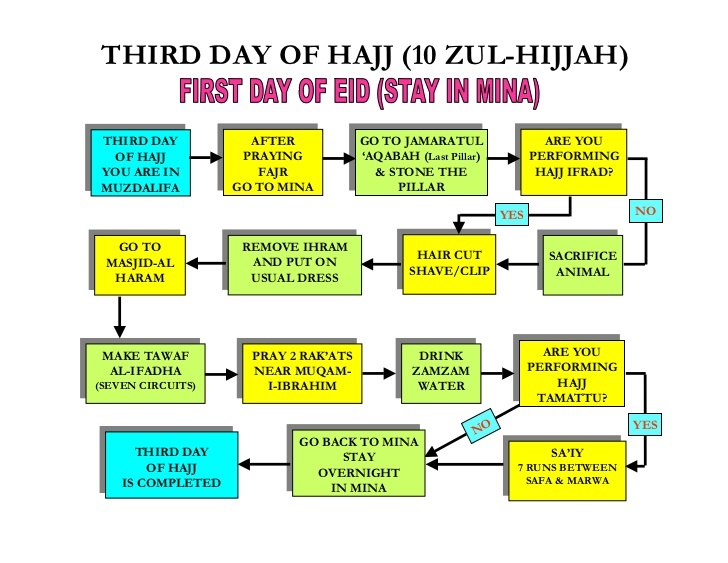 They then return to Mina to throw pebbles at three stone pillars on the 11th and 12th of Zil Hajj. The pilgrims then leave for Makkah to perform Tawaf-e-Wida. This Tawaf marks the completion of Hajj. Toothbrush and Miswak can be used. Harmful insects can be killed. Only those Halal animals can be eaten, which are not hunted. Blanket can be used for covering the body but not the face. I hope the Method of Hajj was clear enough for you to understand so that you can also follow it before performing the pilgrimage.